Lebanese President Emile Lahoud declared a state of emergency and gave control of the country to the army on Friday night, just hours before he left office without a successor. Lebanon's president declared a state of emergencyjust hours before he leftofficelateFriday without a successor, in a move that threatened to pushthe politically divided country into further uncertainty. President Emile Lahoudasked the army to keep security in the country starting at midnight, when his presidency officially ended, according tohis spokesman. "The president of the republic declares that because a state of emergency exists all over the land as of Nov. 24, 2007, the army is instructed to preserve security all over the Lebanese territory and places all the armed forces at its disposal," Rafik Shalala said. Shortly before midnight local time, the 71-year-old pro-Syrian politician walked down the palace driveway as a presidential guard played the national anthem. The president cannot declare a state of emergency without approval from the cabinet, but Lahoud's spokesman said Prime Minister Fouad Siniora's government is considered unconstitutional. The statement instructed the army "to submit the measures it takes to the cabinet once there is one that is constitutional,"Shalala said. The move was quickly condemned by his political opponents. The emergency rule declaration comes as Lebanon's sharply divided parliament has been struggling for months to agree on a candidate to replace Lahoud. 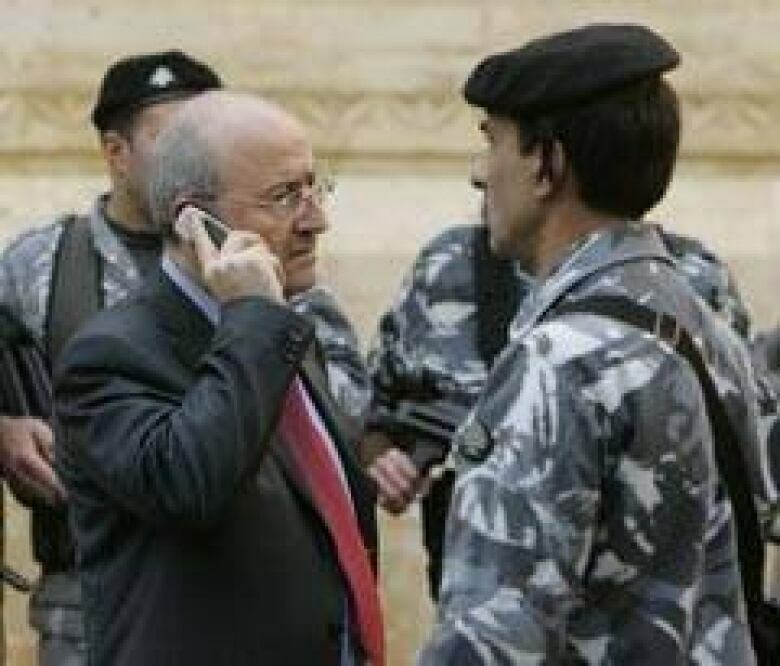 The CBC's Nalah Ayed, reporting from the capital Beirut, said some had feared Lahoud would hand full control of the country to the army andits chief, Gen. Michel Suleiman. "Lahoud isasking [of the army] less than what was expected and what was feared by some quarters here," she said. "Implicit in that is he is allowing the status quo to continue." Ayed said the move likely means Siniora, a staunch anti-Syrian, will continue to serve as prime minister and may even take over some presidential powers. If this is the case, it contrasts Lahoud's previous vows that he would never hand over the reins to Siniora while parliament worked to pick a new president. Despite the possibility that Siniora may take on some presidential duties, he was quick to condemn Lahoud'sdeclaration ofemergency rule on Friday. One of his spokesmen, speaking on condition of anonymity to the Associated Press, said Lahoud needed to have full cabinet support to legally install a state of emergency, but he did not. "[The state of emergency]has no value and is unconstitutional and consequently it is considered as if it was not issued," said the government spokesman, who asked not to be identified because an official announcement has not yet been made by the prime minister. "Any decision not issued by the cabinet has no constitutional value." The state of emergency came the same day that a scheduled parliamentary vote to replace Lahoud fell apart and was cancelled. Opposition members, who are pro-Syrian like Lahoud,boycotted the 1 p.m. session, meaning the legislature did not have the necessary two-thirds quorum needed to begin casting ballots. Another date for a vote has been scheduled for Nov. 30, a week after Lahoud's term expires. Hours after the declaration, United NationsSecretary General Ban Ki-moon called for all parties tomaintain calm and work toward a compromise on the presidential impasse. "The Secretary General urges all parties to live up to their responsibilities and to act within the constitutional framework as well as in a peaceful and democratic manner," Ban's spokeswoman said in a statement. Parliament Speaker Nabih Berrisaid in a statement that he hoped the extension to Nov. 30 would give legislators more time "for additional consultations to reach a consensus on electing a president." Ayed said there is little hope that a week will make a difference. Parliamentcancelled votes in September and Octoberbecause rivalleaders could not find a candidate agreeable to both sides. The ruling anti-Syrian bloc, which opposes Syrian influence in Lebanon and is supported by Western countries, only has a slim majority in the parliament. A vote for president mustpass by a two-thirds majority. "There have been incredible attempts to try to get the two sides to agree on a candidate for weeks now, and they have not been able to agree,so everybody here is telling us they're quite skeptical that they'll be able to agree on something by next week," Ayed said. "In the meantime there will be that one week of uncertainty, and certainly that'sleaving the Lebanese quite nervous about what is going to happennext." Ayed said the fear is that if a new president isn't chosen, it will create a potentially dangerous power vacuum. In such a vacuum, the pro-Syrian and anti-Syrian sides could create two rival governments, as they did during the civil war that gripped Lebanon from 1975 to 1991. "It is possible the country faces the prospect of having two rival governments, which would not only lead to chaos, but could also lead to violence," Ayed said.